A brief look at the people involved. Ikue Mori played drums as part of DNA in the late 1970s, a group which was part of New York's 'No Wave' scene which raised more than a few eyebrows as they pushed the boundaries of Punk/Avant/Freeform and crossed over into each territory, much to the alarm and/or delight of all who witnessed them. She has since become one of the shining lights in the 'improv' world with her manipulation of the drum machine amongst many other pursuits. Kato Hideki was an original member of Japan's powerhouse collective- Ground Zero in the early 1990s. He recorded with Bass Army- a Japanese trio of bass players (! ), he has also performed live with the likes of John Zorn (the man behind the Tzadik label), Turntable magician Otomo Yoshide and ex-Scorn/Napalm Death/Painkiller player- Mick Harris. Fred Frith was a member of the leftfield 1970s British outfit Henry Cow, he was also in their later 'incarnation'- The Art Bears and has since gone on to release a string of solo recordings and has had just 'one or two' collaborations under his creative belt as well as being called for his services to a wide range of music makers including The Residents and Robert Wyatt. As with most of the releases on Zorn's Tzadik imprint, you can never predict just what you are going to hear- but there will be one thing for sure- it's going to be an album of incredible sound composition and experimentation. When you see the line-up of guitar, bass guitar and drum machine, you would probably expect an updated version of the late Metal Urbain! To expect this array of instruments to be limiting, would be to say that a pen and paper is limiting, but equip these ultra talented individuals with them (...er...guitar, bass and drum machine that is!) and a grand tapestry of sound soon enfolds. Hideki's bass tones are an overall wash in themselves, whilst the doctored and midi- driven drum machines in Mori's hands produce sounds which have you scratching your head and finding it hard to believe the origin of their source. Fred Frith is an incredible guitarist, one of the few people who can just have a basic guitar to amp set up- with almost no effects (apart from his trusty volume pedal) and coax tones and colours in a kaleidoscope of scrapes, plucks, brushes and strums. He's not afraid to use something more than a plectrum either- shoe polishers have been known to be part of his many accessories. This music does have to have time to grow on you though, especially with those unfamiliar with any of the names here. Tracks like "Imperial Thorn" have an almost Ennio Morricone feel, all rubber band bass dumps with Frith flicking trebled phrases into the air which gauge the landscape with Mori's reverbarating and spiked percussives. "Alchemy" is a very fitting title for the groups manouveres with Mori providing some glass droplets from her machines as Frith and Hideki provide a 'quiet happening'. "Broken Blue" is a sonic conversation with some wonderfully odd guitar sounds, some heavy drummachineing (ha!) and sparse bass notes. Sparse is the operative word with these tracks and to carve these odd but magnificent snapshots, relies on the seasoned ears of the people involved. "Flash" is one of the longer pieces at just over 5 minutes. But it unfolds into a mini-barrage of low rumbling bass figures, feedback enriched guitar while a swarm of god-knows-what rises out of Mori's pandoras box of tricks. The final track-"Ways Out" has a Frith playing a delicate succession of chords to a slow thump rhythm. 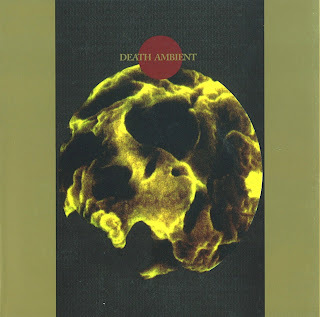 I suppose 'Death Ambient' is a good description for this odd but 'rewarding' CD and is far from what some might think of as being 'arty noodling'. "A condition in which one type of stimulation evokes the sensation of another, as when the hearing of a sound produces the visualization of a colour".